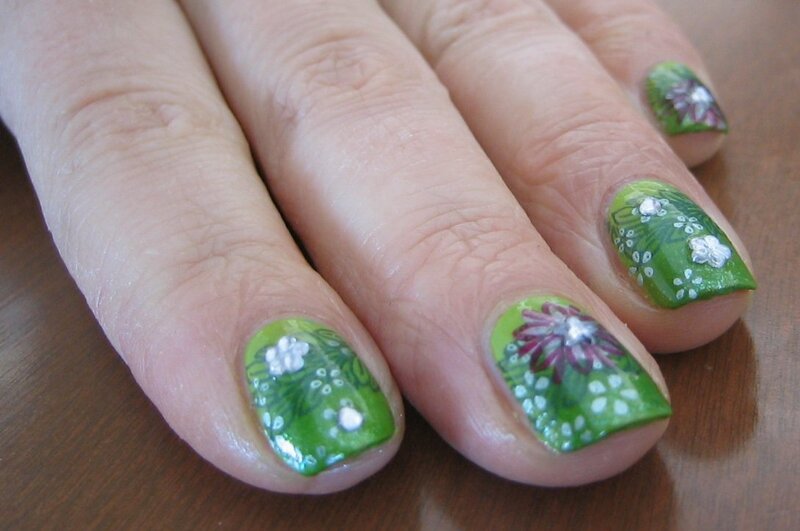 I just want to begin by sending out mad props to Ainos at Glammed-Up for all her deliciously layered manicures. They remind me of those intricately hand painted silks I saw when I was in the fibre department of my art school. She's really inspired me to look at every polish for stamping purposes, to layer stamps and polishes and to try for partial stamping too! This is my first purposefully layered manicure. Not ONE special stamping polish was used! 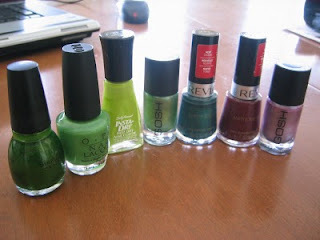 I started with a base coat of Seche Clear, then one coat of Sally Hansen Insta Dri Lickety-Split Lime. When that was dry I sponged on three layers of OPI Green-Wich Village three quarters of the way up my nail, then a few layers of Sinful Colors Show Me The Way just at the tips. 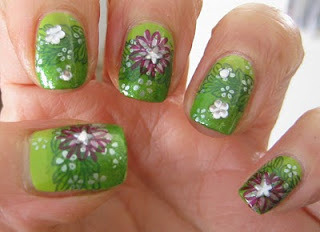 I then used GOSH Metallic Green and BM10 to stamp a random spray of little flowers. It also hinted at a dewy sparkle. After that step I thought I failed my nail. 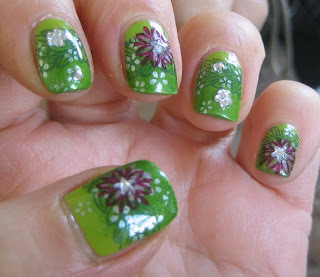 I used GOSH Metallic Purple and BM06 to stamp the Dalia-esque flower. There wasn't very much contrast at all and it just looked like a light metallic pink blob on top of all that work! But I have seen stamping done over top of smudges of color-especially with flowers-before so I hurriedly chose the Revlon Matte Suede Ruby Ribbon and stamped on the flower image from BM03 over top. SAVED! And it looked prettier than I could have hoped! I only placed the pink flowers on every second nail, then I placed rhinestone stars in the center of every pink flower, and a flower rhinestone coupled with a tiny round rhinestone on the other four remaining nails just to even out the sparkle. Thanks again for stopping by. I can't believe how my list of friends has grown and I thank you all for you support and comments! I want to say that I am on a hunt for GOSH Holographic and if I find some I'll buy two! One for me and one for my giveaway! Still working on that puppy. love the mani....i'm so ready for spring! i wish spring was in Poland now! we've got loads of snow here! this is hot, really pretty, we are going into Autumn here! But I love it anyway. AHHH I love them! So pretty! Wow you did a lot of work on this and it shows! Paulina: Well we still have a boatload of snow too, but I'm wishing for spring to roll in soon. I'm tired of the winter blahs. Banana: Yep I'm all about the green. I just picked up yet another green for my collection (like I needed more after Christmas). I couldn't say no to Essie Sew Psyched on sale. Freshie: Cheers! :D I appreciate that. It was quite a bit more work than I have put into previous manis but it was also a lot more fun! 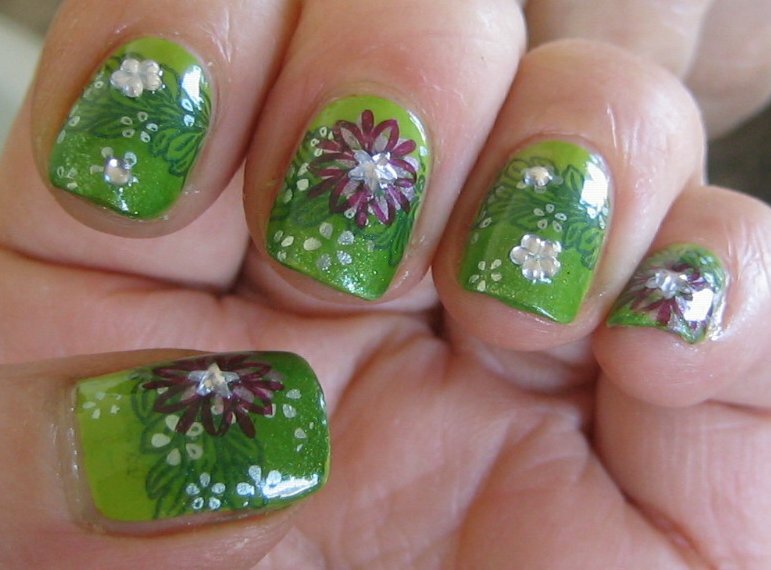 This is a very awesome mani! 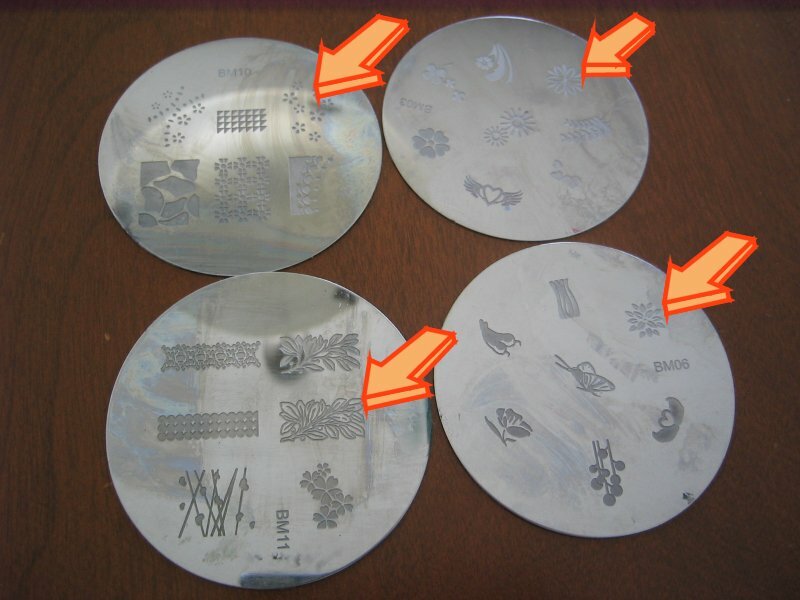 You're very creative with Konadplates!